Play Dramatizes Beethoven's '33 Variations' An often-overlooked piano work of Beethoven has a starring role in a brand new play in Washington, D.C. Characters in 33 Variations include Beethoven himself, and a 21st century musicologist obsessed with the composer's "Diabelli Variations." 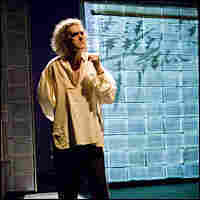 Graeme Malcolm portrays Ludwig van Beethoven in 33 Variations. An often-overlooked piano work of Ludwig van Beethoven has a starring role in a new play in Washington, D.C. Characters in 33 Variations include Beethoven himself, and a 21st century musicologist obsessed with the composer's "Diabelli Variations." In the early 1800s, a music publisher named Anton Diabelli wrote a waltz and invited the best composers in Vienna to compose one variation on it for publication in a single, handsome volume. According to legend, everyone accepted the proposal except Beethoven, who initially considered Diabelli's composition trite and insignificant. But he eventually became obsessed with it and wrote 33 variations, taking the better part of three years to do it. Diabelli's theme has been criticized for its predictability, lack of imagination and repetition. It is split into two 16-bar phrases, each of which repeats exactly. The original work lasts about 45 seconds, but Beethoven's variations can last 45 minutes or longer. In Moises Kaufman's play, we see Beethoven attempting to wring every possibility from the waltz. Pianist Diane Walsh, also onstage, plays the music going through the composer's head. A third character, modern day musicologist Katherine Brandt, is studying Beethoven's sketchbooks at the Bonn archives. She's terminally ill, and desperate to solve the riddle of his fascination. "It's really a question about inspiration ... what is it that Beethoven sees in this 32 bars of nothing?" says Kaufman. "I always say it would be like if Philip Glass found a song by Britney Spears and decided to spend the next four years of his life studying and making variations on it." 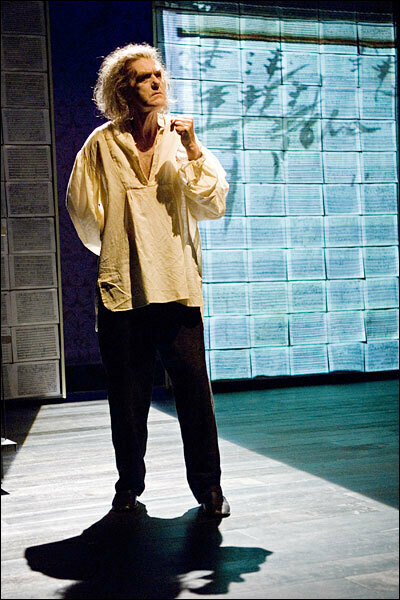 Kaufman, who also directs the play, has had previous successes with productions based on historical texts. His play Gross Indecency tells the story of Oscar Wilde through court transcripts and newspaper accounts, and The Laramie Project chronicled the death of Matthew Shepard in Laramie, Wyo., using words from interviews with townspeople. Kaufman consulted with several of the world's most respected Beethoven scholars in the four years he was researching and workshopping the play. He says that he is obsessed with Beethoven's process, because mistakes and dead ends can often shed the most light. "The important thing in an archeological dig is not only the objects that are found, but looking at the dig itself, and seeing where every shovel came onto the earth," Kaufman says. "All of the marks are part of the thing that was rescued." 33 Variations is currently having its premiere run at Arena Stage in Washington.